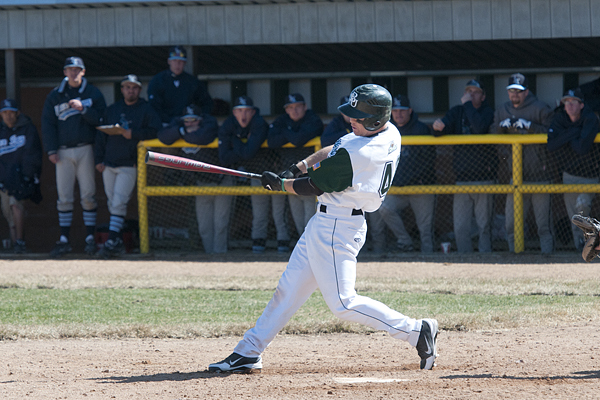 The Bemidji State University baseball team fell 10-6 and 12-1 (8 innings) to Augustana College Sunday in a cold and rainy Northern Sun Intercollegiate Conference doubleheader at the BSU Baseball Field. The Beavers are now 15-17 overall and 8-10 in league play. Augustana jumped on BSU’s game one starter junior right-hander Logan Kalis (Little Falls, Minn.) and posted four runs in the second, two in the third and one in the fourth to open a 7-1 advantage through four. Despite allowing just one run on two hits, Viking starter Casey Jacobson was taken out of the game after three innings and replaced by Sam Gotham. The Beavers scored four runs in the fifth off Gotham and three Augie errors that extended the inning for BSU. Senior Juan Molero (OF, Maracaibo, Venezuela) led off the frame with a single up the middle, then a fielding error by the AC shortstop allowed sophomore Kean Paxton (2B, Brooklyn Park, Minn.) to reach first on a fielder’s choice and move Molero to third. Junior Lewis Baumann (MIF, Colorado Springs, Colo.) was beaned in the back to load the bases for nine-hole hitter sophomore Chad Hanson (OF, St. Paul, Minn.). The left fielder took a hack at an 0-2 pitched and softly chopped it up the third base line, forcing the Augie third-bagger to go home, but the throw was errant and Molero scored and the bases remained juiced with zero outs. Junior Trevor Purvis (OF/P, Rio Rancho, N.M.) produced an RBI on a productive out to first base that plated Paxton. Junior Riley Hirsch (C, Little Falls, Minn.) scored Baumann in a full count chopper between the pitcher and first base for an infield single. Hirsch’s speed forced the Viking first baseman to hurry a throw to the pitcher trying to cover and he threw it away to let Hanson score from second and the game was all of a sudden a two run contest at 7-5. Augie center fielder Brendan Phillips saved a run on a diving catch in left center off the bat of junior Jaryd Marks (RHP/1B, Cottage Grove, Minn.) that had RBI double written all over it. Hirsch ended up recording the third and final out at second on a controversial caught stealing call. In the end, BSU scored the four runs on just two hits, being guided by the three Augustana errors. With freshman righty Mike Hanson (Cass Lake, Minn.) dealing on the mound for BSU the Vikings went 1-2-3 in the sixth and the momentum continued to stay with Bemidji State. The Beavers produced a run in the sixth that was led-off with Kalis getting hit by a pitch. Senior Mauricio Gomez (3B, Caracas, Venezuela) singled right to make it first and second, then Molero laid down a sacrifice bunt to move the runners up a base. Paxton produced an RBI with a ground out to second and the home team was within one at 7-6. But the momentum quickly swung back into the favor of the Vikings in the top of the seventh as they totaled three runs to take a 10-6 lead into the bottom of the half. BSU was hoping to contain Augie with bringing in Marks to pitch after Hanson walked the first batter of the inning, but Marks allowed three sharp hits and the deficit was four. The mountain proved to be too large in the bottom half of the seventh and the Beavers fell 10-6. Kalis allowed seven earned runs on nine hits with two strikeouts. Hanson pitched two innings and allowed the one run on two hits with a K. The Beavers totaled just five hits, while allowing 14. All the hits came off the bat of a different player, while Purvis posted two RBIs and Baumann scored twice. The Vikings continued to hit the ball hard to open game two and scored five in the first inning to take the early 5-0 lead as the rain picked up from the light drizzle that came down in game one. BSU starter junior Ryan Van Someren (RHP, Milaca, Minn.) was just a strike away from getting out of the inning unscathed, but a bases loaded poke to left by Troy Pilkington – his first at-bat of the series – on a 2-2 count plated two runs and the hit parade got going and in the end the Beavers faced the 5-0 deficit. A two-run third made it 7-0 for Augie, then three runs in the seventh and two in the eighth made it 12-1 and the game ended on the 10-run rule. In the nine-inning NSIC games there is a 10-run rule after seven innings. BSU posted its one run in the bottom of the fourth with back-to-back two-out hits from Kalis and Molero. The Beavers had six hits in the game, two from Kalis. Van Someren pitched seven innings and allowed 10 runs (eighth earned) on 13 hits with two strikeouts. The Beavers concluded their 14-game homestand in 16 days with a 5-9 record and now go on the road for the next eight games. BSU’s next action is slated for April 18 at University of Minnesota, Crookston with a doubleheader beginning at 4 p.m.